§ 10 cents increase in non air-con fares generally. § 5 to 10 cents increase in air-con fares with no change to the minimum (60 cents) and maximum fares ($1.20). § Extension of the maximum bus fare by another fare stage (over 18.4 km) to $1.10 and $1.40 for non air-con and air-con services respectively (equivalent to a 10 cents increase). § 5 cents increase in feeder fares and industrial fares to 30 cents and 45 cents respectively, with the corresponding introduction of a 5 cents transfer rebate for feeder buses. § $2 increase in concession stamps prices for tertiary students, NS men and SBS shareholders. § 5 cents increase across the board for non air-con services on farecard fares. No change for air-con farecard fares. § 10 cents increase across the board for air-con and non air-con services on cash fares. § Conversion of flat fare to distance-related fares for industrial bus services. § $3- $5 increase in non air-con bus concession stamp prices. Similar to fares on existing RTS lines, distance-related fares were adopted for Bukit Panjang LRT. § 10 cents increase in adult feeder bus fares (cash and farecard) with a corresponding increase in the feeder transfer rebate by 10 cents (from 5 cents to 15 cents). § 5 cents increase in child/student feeder bus fares (cash and farecard) with a 10 cents increase in the feeder transfer rebate (from 5 cents to 15 cents). § Extension of the maximum fare by another fare band (over 23.5 km) to $1.30 and $1.60 for non air-con and air-con services respectively for cash fares, and $1.25 and $1.50 for non air-con and air-con services respectively for farecard fares. § Addition of 2 fare bands to the fare structure of Jurong industrial bus services (maximum fare was increased by 20 cents). 10 cents increase in the LRT Single Trip Ticket adult fares (the new minimum became 80 cents while new maximum was $1.00). No change in adult farecard fares (minimum was 60 cents and maximum was 80 cents). § 10 cents increase in feeder bus fares with corresponding increase in transfer rebates by 10 cents (feeder bus transfer rebate became 25 cents, the same as the transfer rebate involving non-feeder bus services). 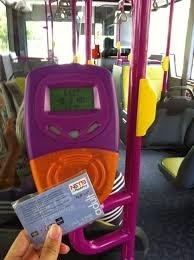 § 3 cents increase in adult EZ-link card fares. § 5 cents increase in adult farecard fares. § 10 cents increase in adult cash fares. § 50 cents increase in concession stamp prices for primary/secondary students. § $2 increase in concession stamp prices for tertiary students. § $3 increase in concession stamp prices for NS men. § Differentiated fares for the NEL at 5 cents to 25 cents higher than the existing RTS fares, or an average of 16.5 cents more. § Fares for child/student/NS men concessions remained the same as that for the existing RTS lines. § 1-2 cents increase in adult EZ-link card fares. § 1 cent increase in senior citizen EZ-Link card fares and 10 cents increase in senior citizen cash fares. § 1-3 cents increase in adult EZ-link card fares. § 1 cent increase in senior citizen EZ-Link card fares.